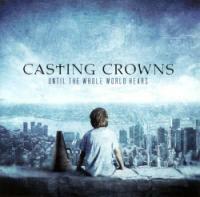 Casting Crowns has cultivated quite a following since they released their self-titled debut six years ago. The evidence? Six consecutive Dove Award wins for "Group of the Year," four Platinum and two Gold record and video certifications, plus a GRAMMY Award and an American Music Award. Not bad for a youth group band originally signed to bolster Mark Miller's (of Sawyer Brown) Beach Street Records imprint. And while their hooky pop/rock melodies and made-for-church worship lyrics have maintained an arena-sized audience since day one, the band has always drummed up ho-hum musical schemes, making their monumental success somewhat of an anomaly, or miracle, from a music perspective. But Until the Whole World Hears ups the musical ante a bit, with some borderline poetic verses and interesting musical riffs. Uncustomary electric guitar licks infuse the title track with a real rock vibe, emphasized by a backing chorus that will become a perfect sing-along for live audiences. "If We've Ever Needed You" and "Always Enough" are darker inspirational anthems, admitting our longing for a Savior. And "Joyful, Joyful" is perpetuated by a driving string section, a fitting ode to the song's origins—Beethoven's Symphony No. 9. Call me a cynic, but many of these tracks still suffer from the "Crowns Cliché Syndrome," using lyrical Christian-ese to produce trite rhymes that seem hard-pressed to energize a ready-to-worship crowd. However, apparently millions of Christians, and probably some non-Christians, are gravitating to the force that is Casting Crowns. Or maybe the band is just a humble conduit for the real power, God, who uses whoever He wants, whenever He wants, to impact the world. Mark Hall & Co. want to impact the world for Christ. Apparently the Lord is taking notice. **This review first published on February 2, 2010.